We’d love your help. Let us know what’s wrong with this preview of The Devil's Hairball by Peter Caffrey. When Victor Holycross commits an act of heinous sacrilege at the Festival of the Blessed Virgin, he unwittingly brings forth a curse that transforms his wife and daughter into living hair balls. To seek absolution and lift the hairy plague, a penance is given: the recovery of stolen religious relics. With a time frame of forty days and forty nights and a bicycle as his sole When Victor Holycross commits an act of heinous sacrilege at the Festival of the Blessed Virgin, he unwittingly brings forth a curse that transforms his wife and daughter into living hair balls. To seek absolution and lift the hairy plague, a penance is given: the recovery of stolen religious relics. With a time frame of forty days and forty nights and a bicycle as his sole form of transport, Victor finds himself helped (and often hindered) by a one-legged whore, a talking dog with strange sexual proclivities and an attack-nun. Thrust into a maelstrom of demonic confrontations, unholy alliances and duplicitous relationships, he soon discovers that the world is a darker place than he anticipated. To ask other readers questions about The Devil's Hairball, please sign up. 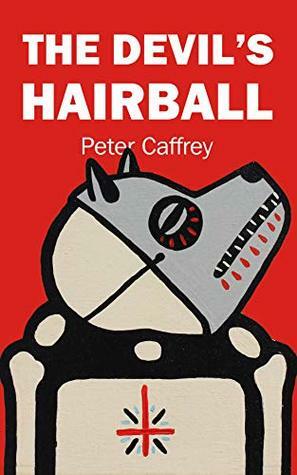 Peter Caffrey is a writer of fiction with an absurdist leaning. His novel, The Devil's Hairball , is currently available, with a new novella, The Butcher's Other Daughter, scheduled for publication later in 2019. His work has appeared in Infernal Ink, Horror Sleaze Trash, Danse Macabre, Schlock!, Dark Dossier, Weird Mask, Close to the Bone, Literally Stories and Idle Ink, amongst others. He drinks Peter Caffrey is a writer of fiction with an absurdist leaning.